The scientists, writing in PNAS, are concerned this trend will spread. That is, if China continues to adopt Western consumer habits, they could look to further outsource their carbon emissions to developing countries. The researchers examined CO2 emissions flowing between different regions of China and abroad. The main driver for outsourcing emissions, in the West and elsewhere, has always been labour costs, said Klaus Hubacek from the University of Maryland, US, who co-authored the paper. "China is treating its own hinterland just the way the whole world treats China, which is outsourcing its dirty pollution to the poorer regions. Money chases the cheapest ways of producing goods around the world. "These regions have lower efficiency and less valuable technology, so they create more pollution per unit of output than the richer regions." Though the richer areas can afford to reduce their own pollution, it was cheaper for them to outsource production, Dr Hubacek told BBC News. "In order to achieve pollution targets they might move more production to the less developed areas but potentially at a higher environmental cost, as the overall emissions might be higher." One solution could be to "allocate consumption to the final consumers", so that the richer areas would pay for the emissions they create and the money could be redistributed to improve technology, he added. The abundance of cheap produce from China has led to a "throwaway culture", said Dabo Guan from the University of Leeds, UK, who also worked on the paper. Dr Guan argued that if the West does not change its consumption behaviour towards sustainability, China may start to outsource their emissions further to other developing countries such as India and African countries. 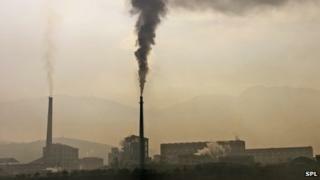 "If they do, global CO2 emissions will grow continuously and it will be very difficult to mitigate," he told BBC News. Dr Guan said a carefully designed carbon tax scheme would help prevent further emission outsourcing and that China could "take the lead on this". Robbie Andrew, a climate economist at the Center for International Climate and Environmental Research Oslo (Cicero), who was not involved with the study, said that China had "cornered the market" in becoming "the world's factory" and that many developing countries were a long way behind. Researchers have projected that China's emissions will continue to rise until about 2030, when they will peak, and such long-term growth "would be a global problem", added Mr Andrew. "Given their main goal is economic development, which is partly about pulling people out of poverty, it may be we overshoot a 2C rise [in global temperatures]," he told BBC News. "There's an over-consumption by the developed world of Chinese goods and not enough feedback to the producers to lower emissions. If we keep on demanding these products, that's an economic signal that we're happy with the way they are producing them."